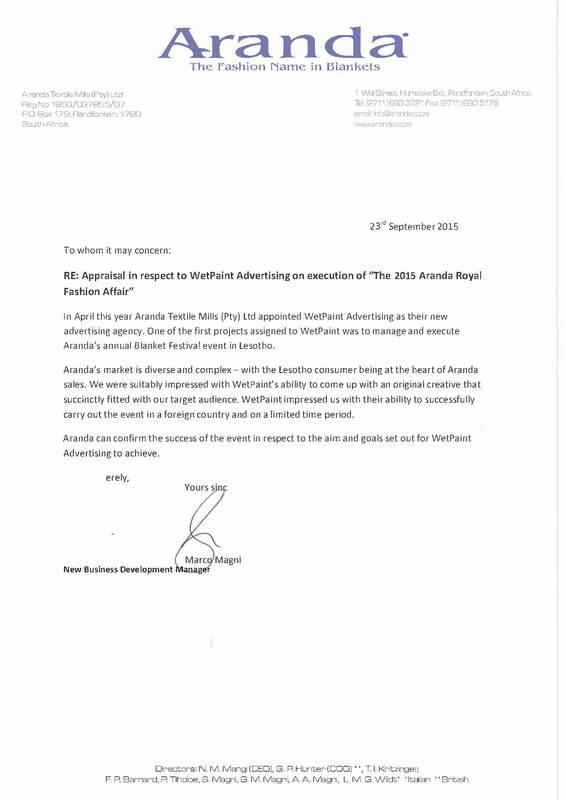 In April this year Aranda Textile Mills (Pty) Ltd appointed WetPaint Advertising as their new advertising agency. One of the first projects assigned to WetPaint was to manage and execute Aranda’s annual Blanket Festival event in Lesotho. Aranda’s market is diverse and complex – with the Lesotho consumer being at the heart of Aranda sales. We were suitably impressed with WetPaint’s ability to come up with an original creative that succinctly fitted with our target audience. WetPaint impressed us with their ability to successfully carry out the event in a foreign country and on a limited time period. Aranda can confirm the success of the event in respect to the aim and goals set out for WetPaint Advertising to achieve.